There is a famous quote from Carg Jung - the meeting of two personalities is like the contact of two chemical substances; if there is any reaction both are transformed. Another quote still refreshes in my mind today on relationships is - All relationships go through hell, real relationships get through it. If we go back to the ancient times, there were no bonded relations but with the passage of time, a man itself created the relations which are acceptable in our society. Relationships of all kinds are like sand held in your hand. If held loosely, with an open hand, the sand remains where it is. And the minute you close your hand and squeeze tightly to hold on, the sand dribbles through your fingers. You may hold too tightly, too possessively and the relationship slips away and is lost. During my seventeen years of association with the police department as a counsellor in the women cell, which started from down offences has ended with the now majority of suspicious nature cases or extramarital relations. The graph of relationships is going down. The priority of dispute in relations now starts with ego followed by misunderstanding, extramarital relations, drug addict, property dispute, interference of parents of both the sides while dowry is at the tail. But the cases registered under the relevant domestic violence, don’t hesitate to say, are with the weight age of the influences over the ‘Khakhi’ - police administration. There was a time when a person in this uniform, irrespective of his status, had a terror among the society but the things look to be reversed and people with political backends have more authority over the police. 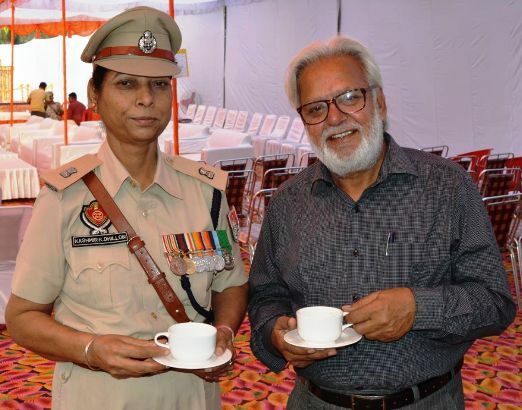 I recollect an incident when I joined the women counselling cell, I used to get the meeting or any other important official document for meeting etcetera through a constable in uniform. When he came for the second time, I was not at home but delivered the official letter to an old lady in our neighbour. Since she was illiterate, could not read it out but asked a number of questions – As to how the police have started coming to your home off and on?, Is everything OK with the Bhai Sahib? Any help from our side as one of the senior police officer is known to us? And so on. When I put her wiser on their visits, she was satisfied rather blessed to continue with the job to save the couples from separation. But I had to speak to the then Police Chief to please direct the concerned section to send an official letter to me through a cop in civil clothes. Frankly speaking, thanks to Almighty, after that there had been no such like incident and Khakhi became friendly for us and everybody in our colony knows the purpose of the visit of a cop in our house even in uniform. It‘s only your attitude that can make the difference between damaging your relationship and deepening it whenever you are in conflict with someone. But what makes it perfect is if you still want to be together even when things go wrong. So, one should never leave a hope for the true relationship over few faults.